Chapoutier is a massive winery and company in the Rhone valley. Chapoutier acts as both a negociant and wine maker in both the Northern Rhone Valley and the Southern Rhone as well. They are active all over the Rhone valley in every major appellation. Chapoutier makes great wine at every price level, from very expensive wines at the top end, to value wines from Cotes du Rhone. Chapoutier is one of the oldest names in the Rhone valley. Founded in 1808 by the Calvet family, it was sold to the Chapoutier family in 1855. The Calvet family sold the company to focus on their large, expanding negociant firm in Bordeaux. Polydore Chapoutier was the first of the Chapoutier family to head the company, and the only head of the firm not to have a name that started with the letter M. That tradition began with the next generation, started by Marius Chapoutier. 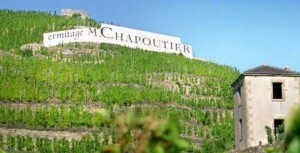 Today, Chapoutier is a massive negociant and winery located in the Rhone valley their offices are situated in the small community of Tain Hermitage. Chapoutier is both a negociant and wine maker. They are active all over the Rhone valley in every major appellation. Chapoutier makes great wine at every price level, from very expensive wines at the top end, to value wines from Cotes du Rhone. Chapoutier is one of the top producers in the Northern Rhone. Aside from Cote Rotie, they also make wine from Hermitage, Crozes Hermitage, St. Joseph, Cornas, St. Peray and Condrieu. However, at least in my opinion, their best wines are their single vineyard wines from Hermitage. They also make top quality Chateauneuf du Pape. Chapoutier produces 4 Cote Rotie wines from 5 hectares of vines. An entry level wine, Becasses and the more expensive La Mordoree. Becasses comes from purchased fruit and is usually produced from a blend of 97% Syrah with the remainder being the white grape variety, Viognier. Those were the initial Cote Rote offerings from Chapoutier. Since the 2015 vintage, Chapoutier added 2 new Cote Rotie wines, Chapoutier Neve and Chapoutier Quatuor. The best vintages of Chapoutier Cote Rotie are: 2018, 2017, 2016, 2015, 2012, 2010, 2009, 2007, 2005, 2003, 2001, 1999, 1998, 1997, 1995 and 1991. Chapoutier La Mordoree is a trademarked name for Chapoutier. This is similar to what takes place with Guigal and their s La Mouline and La Turque wines. The northern Rhone single vineyard wines of Guigal were the inspiration for Chapoutier to begin producing La Mordoree. The fruit for La Mordoree comes from 5 hectares of vines located in some of the best terroir from Cote Blonde and Cote Brune. The oldest vines, some of which are more than 70 years old in Cote Brune, makes up a good part of what goes into Chapoutier La Mordoree. Many of the domaines best vines are located close to the large Chapoutier sign that marks the vineyards location on the steep Cote Rotie hillsides. Michel Chapoutier uses only biodynamic farming techniques for all his properties. The practice of bio-dynamic farming techniques began in 1991. The berries are completely destemmed and fermented in open top fermenters. La Mordoree is a small production wine. On average, only 500 cases are produced each year. The first vintage for this special wine was 1990. Chapoutier La Mordoree is a rich, vibrant, wine displaying purity of fruit, silky textures, expansive aromatics and offers the ability to age and develop for 20-30 years. However, in many vintages, the wine retains too much oak influences for many tasters. In 2014, Michel Chapoutier was named The Wine Personality of the Year the two most important, French wine critics, Michel Bettane and Thierry Desseauve. Chapoutier Neve is a single vineyard wine that comes from the Neve lieu-dit in Ampuis. The terroir is quite rocky with deposits of schist and mica-schist. The grapes are completely destemmed. The wine is aged in an average of 30% new, French oak barrels for 14-18 months before bottling. Chapoutier Quatuor takes its name from the the fact that the vines are placed in 4 lieux-dits, Cote Blonde, Cote Brune, Neve and Tupins. The terroir as you can imagine is mixed, with mica-schist, gneiss, schist and sandy loam. To produce the wine of Chapoutier Quatuor, the grapes are completely destemmed. Malolactic fermentation takes place in a combination that’s evenly split between regular French oak barrels, (Of which 25% are new) and demi-muids, of which 25% are new. The wine is aged for 12 to 18 months before bottling. Chapoutier Becasses, their entry level Cote Rotie made its debut with the 1998 vintage. The fruit comes from purchased grapes located on both Cote Blonde and Cote Brune. The average blend is 97% Syrah with 3% Viognier, although it can vary. The grapes are 100% destemmed. Chapoutier Becasses is aged in mostly neutral, French oak barrels. The remainder of the wine is aged in about 15% new, French oak barrels and stainless steel tanks for 14-16 months before bottling. On average, Chapoutier Becasses produces on average close to 3,000 cases a year. You can drink this delicious Cote Rotie young, while waiting for La Mordoree or the other, higher-end offerings to mature. Chapoutier Cote Rotie, when young, should be decanted at least 1-3 hours, give or take, allowing the wines to soften and open their perfume. Older vintages might need very little decanting, just enough to remove the sediment. Chapoutier Cote Rotie is usually better with 5-12 years of cellaring and should be at its best between 10-20 years of age. Chapoutier Cote Rotie is best served at 15.5 degrees Celsius, 60 degrees Fahrenheit. The cool, almost cellar temperature gives the wine more freshness and lift. Chapoutier Cote Rotie is best served with all types of classic meat dishes, veal, pork, beef, lamb, duck, game, roast chicken, roasted, braised and grilled dishes. Chapoutier Cote Rotie is also good with Asian dishes, hearty fish courses like tuna, mushrooms and pasta. Condrieu, the white wine of Chapoutier is best served with a myriad of different seafood dishes, shellfish, crab, lobster, sushi, sashimi, chicken, pork and veal, as well as Asian cuisine.